When you enter an electrologist’s office you should be aware that the end result of a successful electrolysis treatment is achieved using proven safe medical procedures. After having visited other Electrologist’s offices through out the Valley I have discovered that certified non-licensed electrologists never started or completed a medical grade course in sterilization. For your information 99% of electrologists in the Phoenix area are not licensed and registered as an electrologist. Additionally the only course they have taken is the 120-hour Certified Professional Electrologist course, which does not have a practical examination. Like all electrologists I like to get good nights sleep, however to sleep soundly my conscience has to be clear and the fact that I use dated pre-sterilized disposable probes helps. However that is just one of the many procedures used at Boston Electrolysis for safe permanent hair removal. Pre-sterilized disposable probes are of a major importance and there are far to many uneducated non-licensed electrologists in the Valley that have a total of five, ten and fifteen pairs of forceps at best that are used on daily basis. No doubt, if you have entered an electrologists office you might have glanced at the electrologists work station and seen those five or ten forceps that are immersed in large test tube point first in an aqueous solution of alcohols or some other disinfectant with cotton on the bottom which prevents the tips of the forceps from being damaged. Most non-licensed certified electrologists think that the disposable probe alone provides all the protection needed for a safe electrolysis treatment that will prevent infection. Wrong and for the record forceps during an electrolysis treatment routinely get blood, skin cells, drainage from follicles, sebaceous glands and perspiration on them. After a treatment these uneducated non-licensed certified electrologists routinely wipe their forceps with tissue or cotton and than drop it back in a in a communal test tube with an aqueous solutions of alcohol or some other disinfectant. These non-licensed electrologists think that is all it takes to sterilize their forceps. An active licensed electrologists practice needs a minimum of 50 to 75 pairs of forceps; I personally have 200 or more. Why do I Triple Sterilize My Instruments? I developed this triple sterilization process used at my practice is for our safety. During a new patients consultation I often do a walk through with a physical demonstration to show you how my instruments are triple sterilized. My instruments on daily basis are constantly going through my triple sterilization process so every time I start your treatment I use a fresh triple sterilized forceps in addition to a pre-sterilized disposable probe and gloves. Maintaining an active private practice as electrologists for twenty-eight years with out one infection is not from luck. It is the result of my diligence, hard work and a safety first mind set at all times. My sterilization system starts with taking my forceps at the end every of treatment and placing it in a wet tank sterilizer with a chemical bath using a germicide not a disinfectant. For you consumers and electrologists out there that does not know the difference between a germicide and disinfectant. A germicide completely destroys pathogenic bacteria (disease producing) where a disinfectant only retards dangerous bacteria at best. Most modern germicides will kill pathogenic bacteria on contact however manufacturers still recommend a minimum of two hours soaking to completely sterilize. Nevertheless I let mine soak overnight and the next morning and when I come in I remove the forceps from the chemical-germicide bath and than rinse the chemical-germicide off the instruments with hot water. From there the next step is to place the forceps in the ultrasonic cleaner with fresh tap water with a heaping tablespoon of Tergizide, which is an enzyme detergent. An enzyme detergent destroys and consumes dead microscopic bacteria and dead tissue cells from left over blood or tissue particles while consuming dead microscopic bacteria. Turning on the ultra-sonic cleaner for a minimum one hour completely removes all dead skin cells, dried blood and any microscopic foreign matter in addition to providing a highly polished luster for your instruments. The third step starts with a nylon brush to clean the tips of the forceps and with hot water you rinse the remaining enzyme detergent from the instruments and than wrap and leave them in paper towel for ten minutes. Another important reason for rinsing instruments is to remove chemical and soap residue, which could irritate your patient’s skin. After making sure the instruments are dry with no water spots I place them in my dry heat sterilizer for 60 minutes at 360 degrees for one hour. After they have cooled off they are placed in closed sterile stainless steel container until I am ready to uses them and as long as that container stays closed at all times they will remain sterile. Fact every time every I finish a patients treatment the probe is disposed of and the forcep is placed in wet tank chemical bath again starting the whole process all over again. This is why it necessary for an electrologist to have a minimum of 50 to 75 pairs of forceps. However sterilizing instruments will not help you if your electrologist did not complete a thorough case history on your current health status. However if a patient has a communicable disease such as hepatitis a letter from their physician stating that your condition is no longer contagious is required before your treatment can begin. Some people might call me over cautious however I like to sleep well at night knowing that I have taken every possible safe guard to provide you the best and safest treatment possible. Fact and for the record I sleep soundly because I do not deter from my triple sterilization process. My 28 years as a practicing electrologist has taught me that to leave no stone unturned when it comes to sterilizing my instruments. Fact if you read like to read my booklet and article on how to do a thorough case history please clicks this link below. 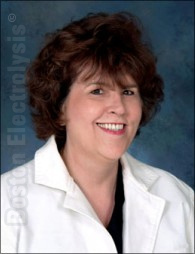 For the record every new patient that arrives at Boston Electrolysis is provided a physical demonstration of how my instruments are sterilized.